The Arizona Soccer Association is proud to announce an enhanced partnership with MaxInMotion that will recognize one ASA player each month, from the months of October through April, with the MaxInMotion Player of the Month Award. 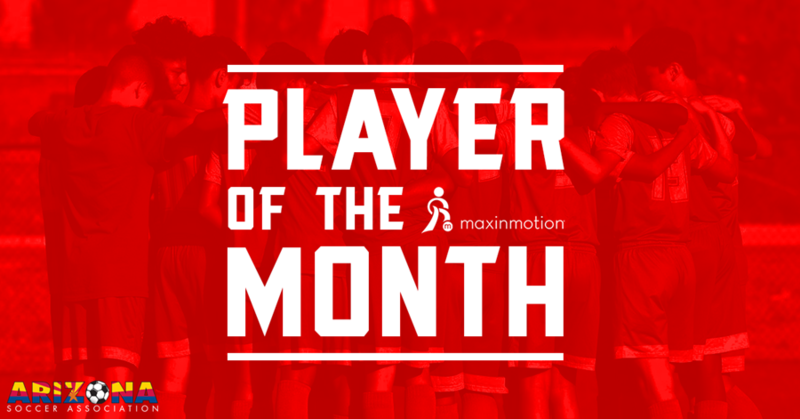 The MaxInMotion Player of the Month will receive $250 that can be used for either soccer or college scholarship. Additionally, at the end of the year, each of the eight MaxInMotion Player of the Month awardees will be eligible for selection as the MaxInMotion Player of the Year. The MaxInMotion Player of the Year will receive $500 that can be used for either soccer or college scholarships. While great performances in the game of soccer are appreciated, it's important to note that accomplishments off the field are valued just as much as those achieved on the field. Nominations can be made between the first and seventh of the month, beginning October. Players from any ASA sanctioned league or Club can be nominated, as long as they are an ASA registered player. For questions please contact ASA directly at 602-433-9202.